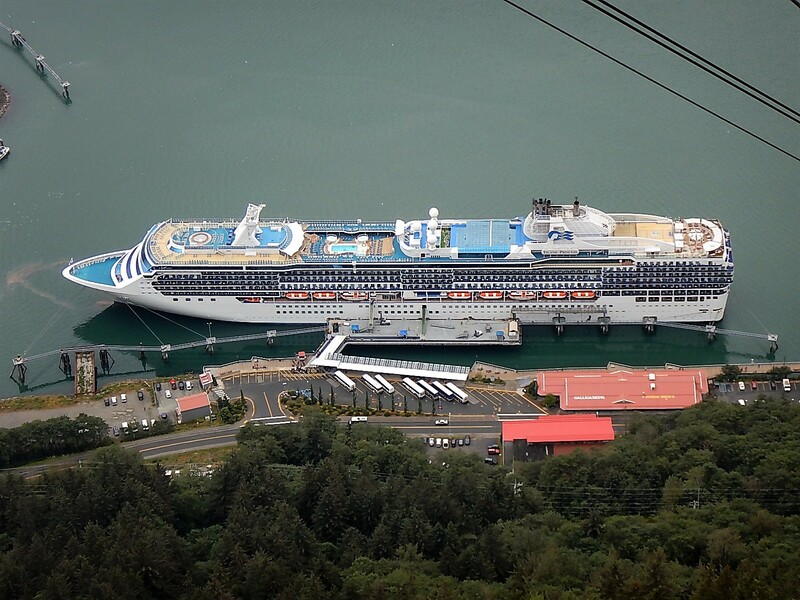 We boarded The Island Princess at Canada Place and looked down from the deck to people watching from the spot where we had stood three days earlier. The weather was glorious and the seaplanes were buzzing around the harbour as we prepared to set sail. We left Vancouver sailing under the Lions Gate Bridge which provided a nice symmetry to our arrival in New York under the Verrazano Narrows bridge three weeks ago (can it only be three weeks?). Once we were underway we took the chance to look around the ship, it is very nice, and has lots of similarities to the Queen Mary 2 but somehow feels like her less fortunate second cousin! The layout is quite different with most of the catering and entertainment facilities forward, that is unfortunate because our cabin is on deck 8 aft so we have to walk the length of the ship and go up six decks to get a cup of tea! Our restaurant, ‘Bordeaux’ is on deck 5, the decor is very similar to the restaurant on QM2 but again it is all just slightly less polished somehow. We met our cabin steward Aerial, he is from the Philippines and very keen to make sure we enjoy our cruise, nothing is too much trouble for him, which is lovely. 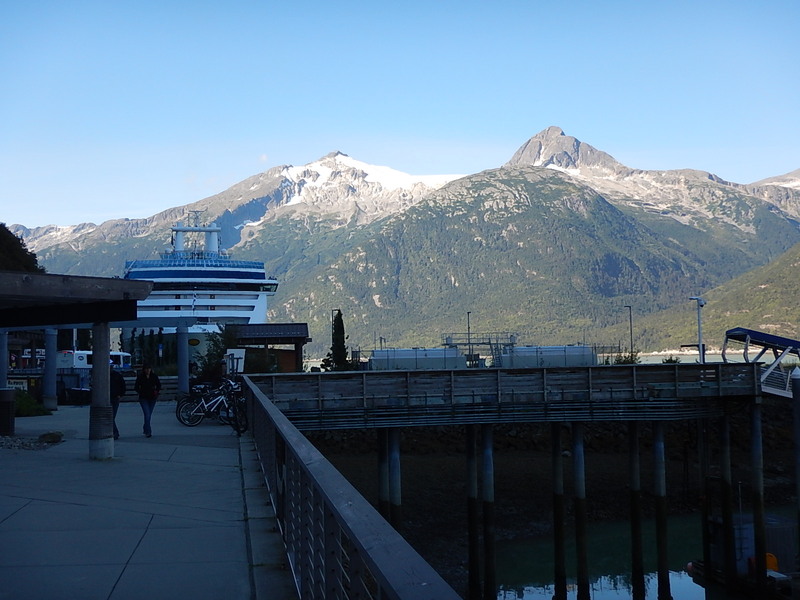 He pointed out a door at the end of our corridor which leads out to a sheltered deck which runs right across the stern of the ship, he told us that not many people know about it and that it is a great place to view Glacier Bay and the other scenic waters we will be cruising. Late afternoon, as we sailed into the Strait of Georgia the crew advised us to look out for humpbacked whales, we headed back to our secret deck and kept our eyes peeled. Sure enough after a while we spotted a tell-tale puff of steam as a whale surfaced to breath, moments later it dived flipping its tail in the air as it went. A few minute later we saw three more whales preparing to dive, and a solitary fifth one in the wake of the ship about quarter of an hour after that. Mia, we have seen the five whales you challenged us to see but even though Mark tried we didn’t get any photo’s, they come and go too quickly – we will keep trying! We had dinner in the restaurant and then retired to our cosy inside cabin, no sea view but it is comfortable and air conditioned, it will suit us for the next few nights. 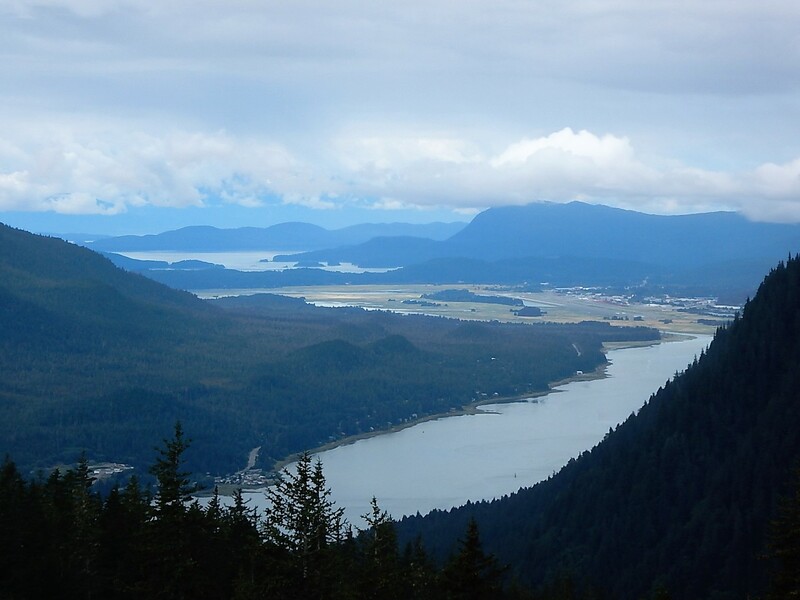 Thursday was a day at sea cruising the coast of British Columbia heading North to Alaska. After breakfast in the top deck buffet (which was swaying a bit) we found an armchair near a picture window watched the waves and read for a while – very relaxing. We also had a look around the Atrium area where all the passenger service desks and shops are situated alongside a couple of bars and glass lifts serving the 4 decks which open on to the Atrium. The shops are all devoted to luxury goods, cosmetics, handbags, jewellery and watches – who comes on a cruise to Alaska and buys a $2500 necklace?? We have noticed a constant flow of inducements to shop on this ship. We get shopping announcements and offers delivered to the cabin and lots of the talks and presentations are thinly disguised sales pitches, the even have a special presentation before each port to help you make the most of the shopping opportunities ashore – needless to say these are heavily sponsored by different outlets, most of which have shops on-board. Needless to say we have ignored all of it!! At dinner on Thursday we shared a dinner table with three passengers from Australia, Terry and Jenny, and Judy who was travelling alone. We had a great evening and got on really well. 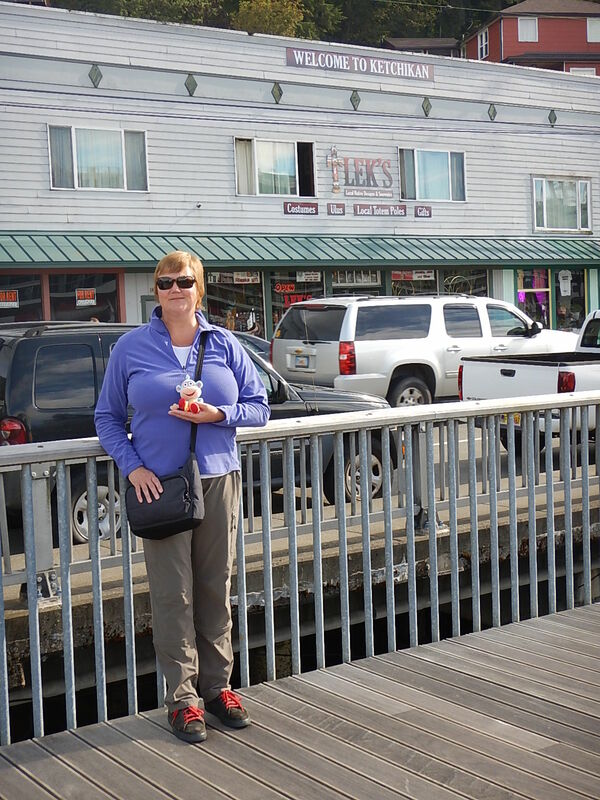 Early on Friday morning we moored in Ketchikan, a small harbour town (about a mile wide and three blocks deep) which grew up around a river which salmon use to spawn. The weather was clear and bright. We haven’t booked any excursions on this cruise, we have chosen to explore the three towns we are visiting rather than travelling elsewhere by bus or boat. After breakfast we went ashore and picked up a map outlining a self-guided walking tour of the town (guided tour $49 per person! ), it took us along the waterfront then up into town passing some historic buildings (1890’s). 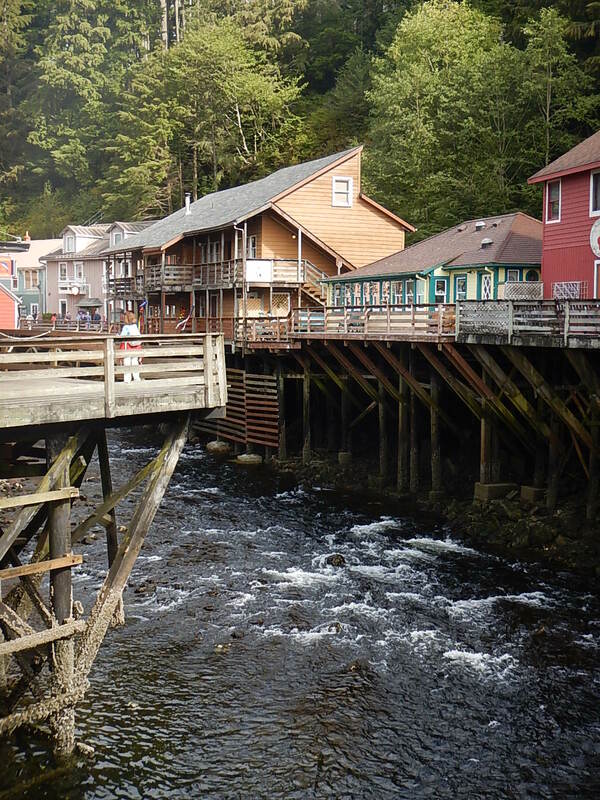 Creek street is a wooden staircase running alongside the salmon creek, it is crowded with old clapboard buildings most of which are now café’s and souvenir shops but which were originally brothels serving the fishing crews and Klondike gold miners. That seems to be the core of Alaskan heritage fishing, gold mining and brothels!! We followed Creek Street up the river to a run of rapids where we stood mesmerised watching salmon trying to leap upstream, the current was so strong it was hard to believe that any would make it but some did and dozens waited in the shallows for their turn. Further upstream we saw the spawning ground and evidence of salmon that had achieved their objective and then died. 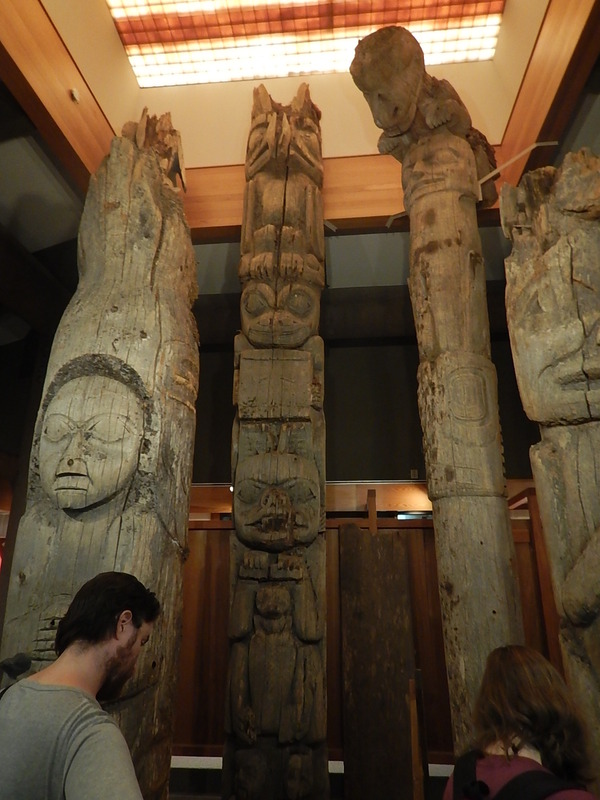 We visited a Totem Heritage Centre, a working museum where they are preserving totem poles and running workshops to ensure the skills and traditions of the Tlinkit tribe continue. We saw some fantastic artefacts, totem poles, masks and beadwork, beautiful. On the way back to town we stopped and talked to a local woman who was happy to chat about her town and its Tlinkit heritage. Finally, we headed back to the ship in time to sail for Juneau and to enjoy the fjord like scenery and snow-capped mountains. Saturday, Juneau, blue skies and sunshine. 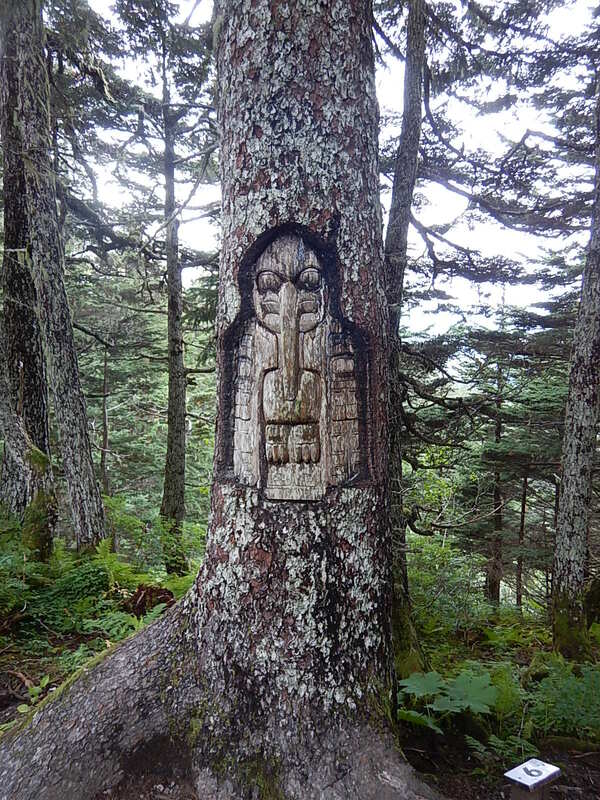 Juneau is the Alaskan State Capital (formerly home of Governor Sarah Palin). It is very small, and only accessible by air or sea. 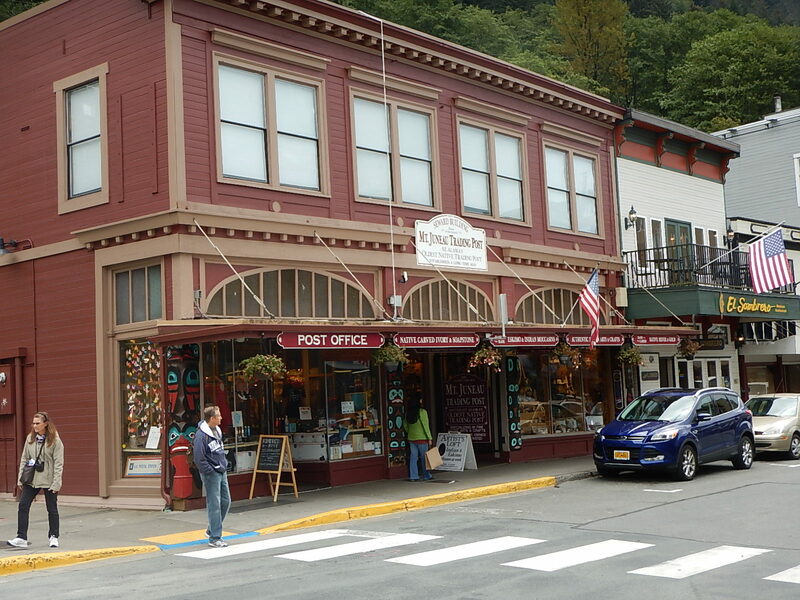 We enjoyed looking around, there was more of a mixture of souvenir shops and ‘real’ local shops and an excellent café serving coffee roasted in Juneau. Perhaps the most impressive thing was the Bald Eagles we could see circling above the streets and roosting in the trees which covered the vertical mountain side towering above town about 4 blocks back from the harbour. 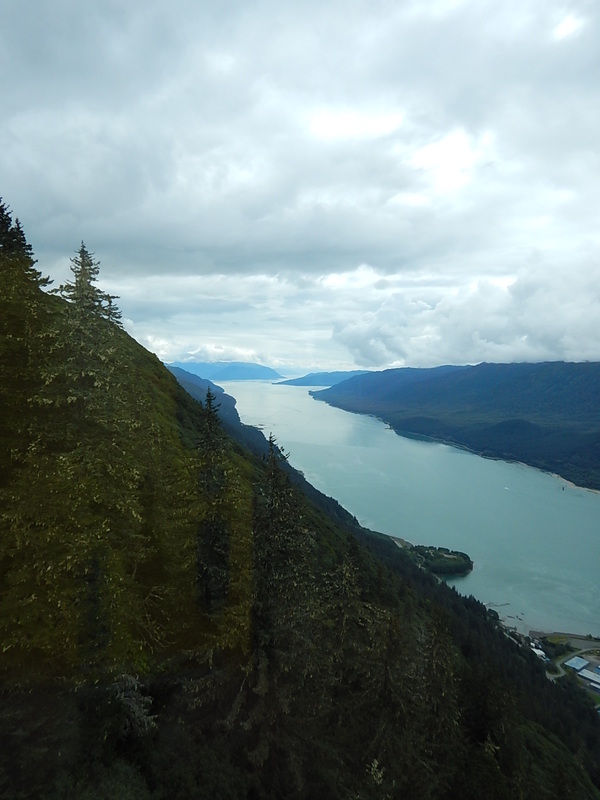 We took a cable car to the top of the mountain, the views were terrific, we had planned to walk back down to town but the signs said the path was steep and rocky and we were warned that it was wet and muddy due to rain the previous day. We decided not to walk down but we did follow a trail around the mountain top which was short but very pretty. Sunday, more blue skies and sunshine – everybody (i.e. seasoned Alaskan cruisers and crew members) tells us this weather is really unusual and that we are incredibly lucky to have it, apparently Alaska is often misty and rainy. Taking advantage we headed ashore to explore Skagway, the smallest of the three ports of call and a town that grew up to service the gold rush. 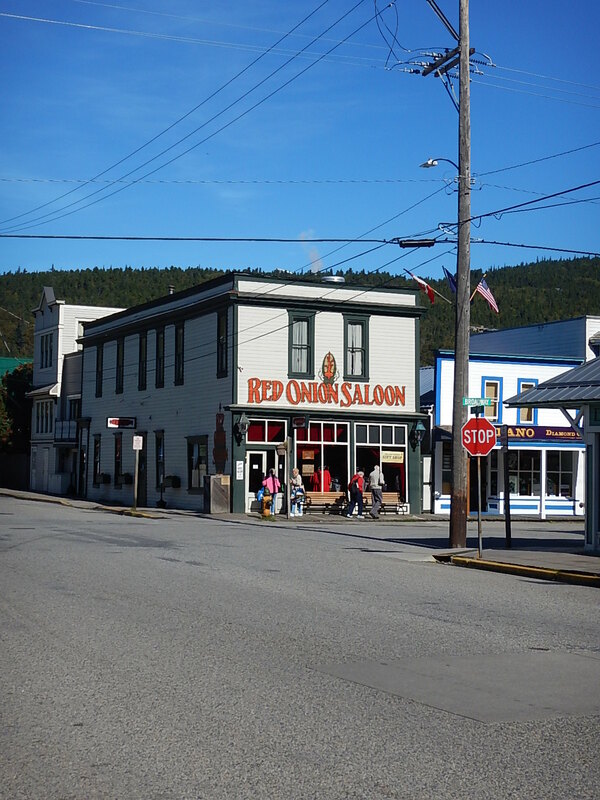 Skagway is exactly what you would imagine a gold rush town to be, clapboard buildings, raised wooden pavements and clear clean air. 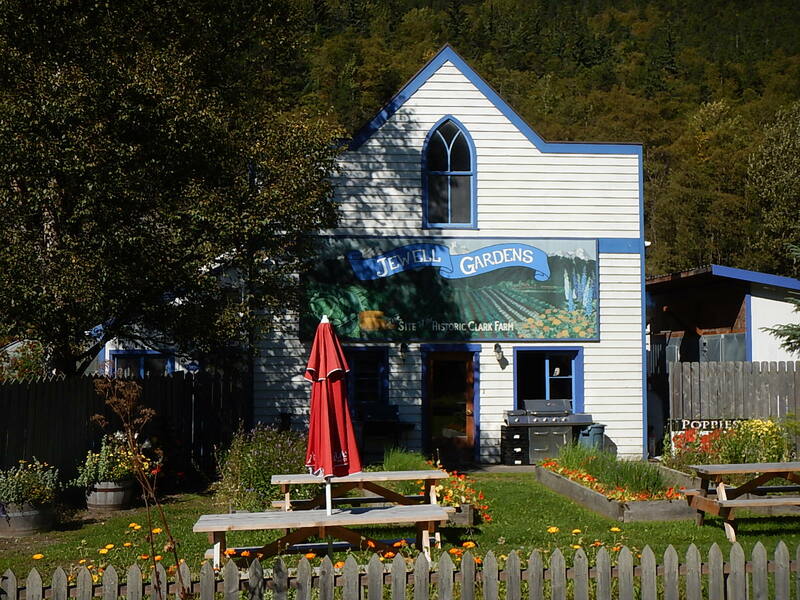 We walked across town passed saloons and stores selling camping and hiking equipment; about two miles from the ship we crossed the town boundary and walked a bit further until we reached Jewel Garden, a small botanical garden which had been recommended by a fellow passenger. It was lovely to look around and we were particularly intrigued to see the vegetable beds. 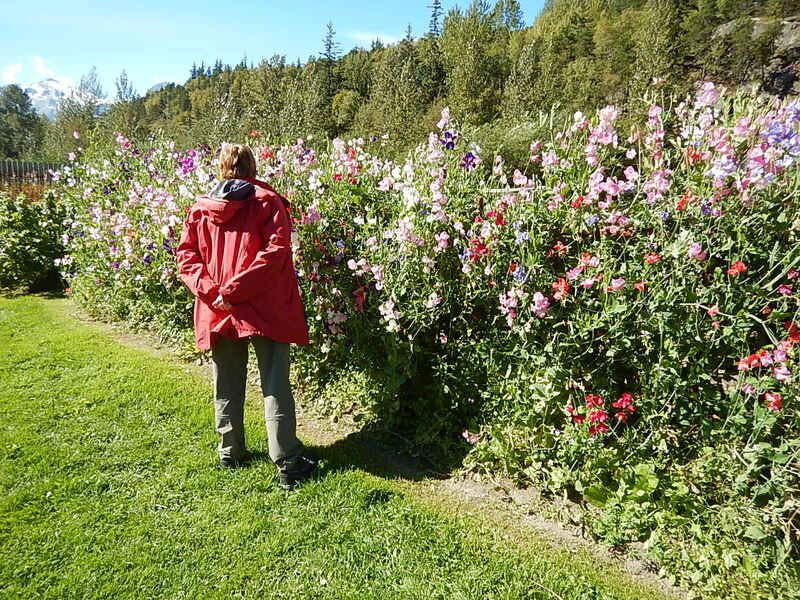 For several weeks a year Alaska gets 24hours of sunlight, one consequence is that lots of plants grow much bigger than elsewhere. We saw cabbages which were 2 foot in diameter and Kohl Rabi the size of footballs. By the time we had walked back to town it was getting quite hot so we headed back to the boat and spent the afternoon next to the pool – we almost had it to ourselves, most people had gone ashore on excursions. I swam, lying on my back looking at the snowy mountain peaks, and spent a very pleasant happy 40 minutes in a hot tub having the Brexit/Trump conversation with a man from New York. 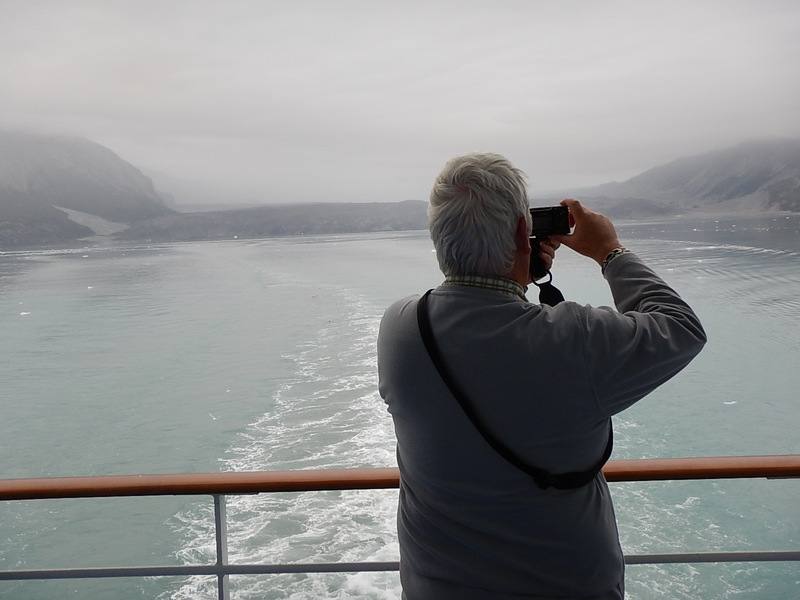 Monday was spent cruising Glacier Bay; this is what most people book this cruise for. Glacier Bay is a National Park and is rigorously managed by the park service to maintain it wilderness status, only two ships a day are allowed into the bay and it is 65 miles to the nearest road. It is breathtakingly beautiful. The bay is a long thin inlet with mountains and glaciers on both shores, some of the glaciers are ‘hanging glaciers’ which mean they are high up in the mountains, others are tide water glaciers which come down to the water an ‘calve’ chunks of ice into the water. Two park rangers came aboard the boat and provided a commentary as we sailed very slowly up the bay, and at the top, at the Margerie Glacier the engines were turned off and we drifted silently in front of the glacier, the only sound was the occaisional rumble which sounded like thunder but was the sound of the glacier moving down the mountain. 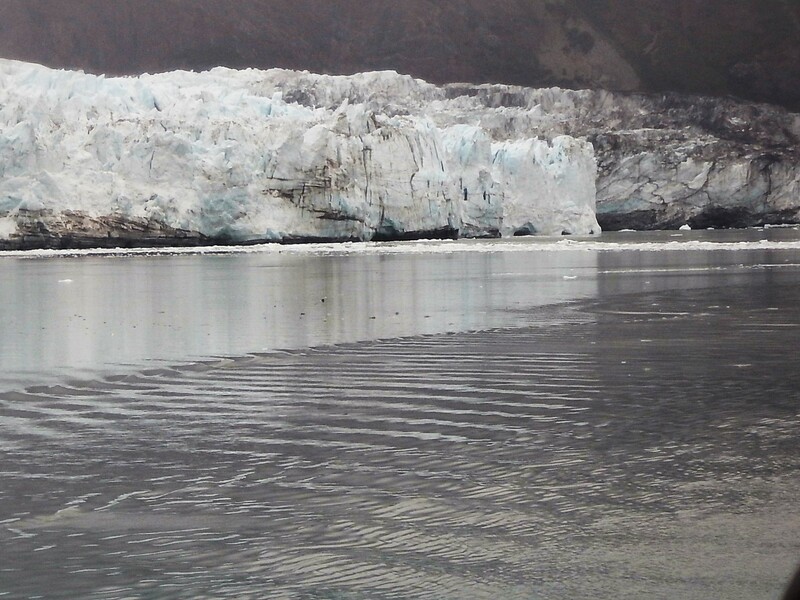 Margerie Glacier moves approx. 10ft every day. Everybody spent ages on deck, the air was cold and clear it was a really memorable experience. 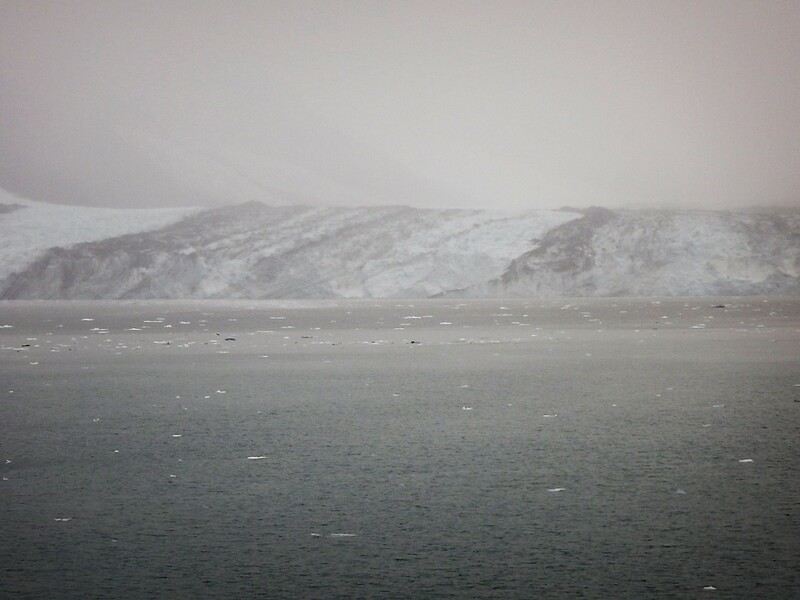 Eventually we turned around and headed back down the bay passing more glaciers, one of which is a rarity, an advancing glacier which means while nearly all other glaciers in the world are shrinking it is growing – maybe there is hope after all? While we were on the balcony on deck 8 watching out for whales Terry and Jenny arrived with a bottle of chilled white wine and we spent a happy hour with them sharing the wine and enjoying the scenery. Monday night was a formal night on-board and we arranged to have dinner with Terry and Jenny and Judy. Unfortunately, dinner co-incided with the ships passage into the open waters of The Gulf of Alaska and things got a bit rough (on the very sensitive Neighbour Scale) so as the others ordered desert we made our apologies and headed back to our cabin. We put on our anti seasickness wrist bands which did the trick and we both slept through the night. On Tuesday the weather finally broke and we woke to heavy cloud, mist and rain. It was another day at sea so we kept our wrist bands on and headed up to the buffet on deck 14 to see what we could see as we ate breakfast – answer not much! We had arranged to meet the Australian trio for coffee, Judy had to leave for a tour group meeting, but we ended up spending three hours with Terry and Jenny, Terry is Sri Lankan and we were keen to get his thoughts on our visit there in February. Late in the afternoon we arrived in College Fjord, another beautiful inlet with a series of glaciers all named after American Colleges; College Fjord is also a whale hotspot and Mark spotted a large pod of Orca’s swimming alongside the ship, we only saw their fins breaking the surface but it was still a thrill. The Harvard Glacier is a tidewater glacier, it is 2km wide and 100m high, a real sight to behold and once again the captain turned off the engines so we could drift in silence in front of it. 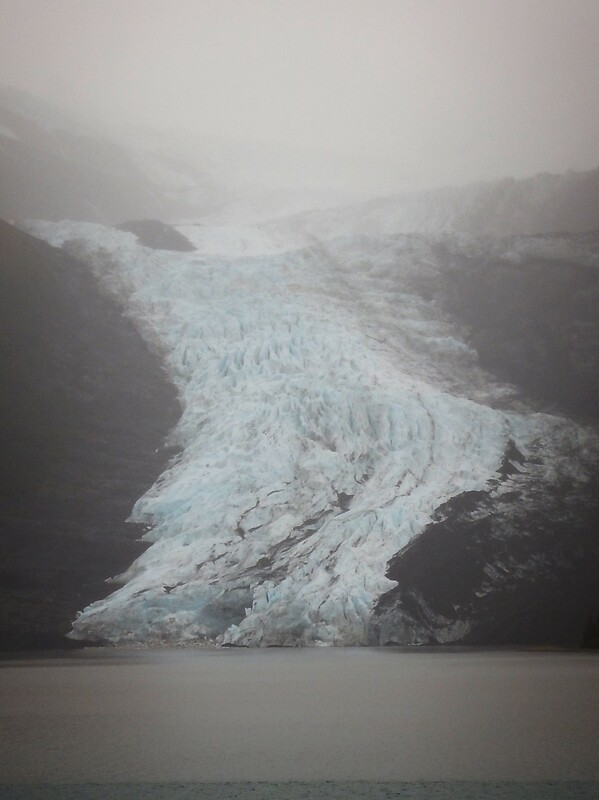 We also saw Johns Hopkins Glacier, another advancing glacier as we cruised back down College Fjord. Tuesday night was our last night on board so after dinner we packed our bags and put them out to be collected and transferred ashore, we were due to disembark at 6.25 on Wednesday morning so we had an early night and started to look forward to our Alaskan land tour.